I thought everyone would enjoy an update about how things are going with karate these days. I’m happy to report that it’s continued to be a huge success for Jack and our family. 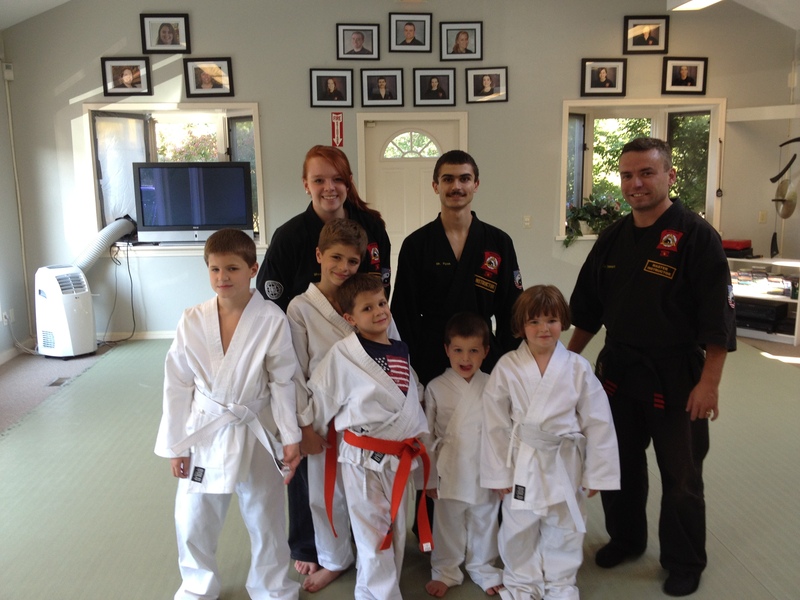 In November, Jack took his first belt test and advanced to the yellow level. He’s enjoyed the new moves, and practices his high kicks and chops in the studio at and home. Each week he looks forward to putting on his uniform and helping to ring the gong at the beginning of class. But perhaps his best karate achievement is that he goes on his own. Every Friday afternoon, the karate van picks Jack and his brothers and sister up from school, and brings them to their afterschool program, where they finish homework and take a regular class with a bunch of other kids. Because although Joe and I greatly enjoyed Cariello Karate—and I totally rocked that white uniform—our ultimate goal has always been to ease Jack into a more mainstream way of participating. That being said, I was a wreck the first day he went without me. Hearing the glee in my boy’s voice made me realize that his experience with karate is more than exercise and white uniforms and shouting Ki-YA. It’s jokes and social growth. It’s independence. We’ve been seeing a family psychologist for about two years now, a wonderfully gifted and compassionate woman who helps us manage everything from Jack’s anxiety to his fear of fire drills and propensity for swear words at family reunions. At our last appointment we were chatting about how far Jack’s come lately, his gains in language and social behavior. She went on to describe how guarded I was when we first met in 2011, how I wanted to wrap myself around Jack and protect him. As she talked, she lifted out of her seat and shifted her body to demonstrate just how I used myself as his shield, his armor, his mother-shell. She noted how I’ve started to step aside and let the world and Jack get to know each other. Although I have never once concealed Jack’s diagnosis from a single person, never hid his autism or kept it a secret, in many ways I positioned myself as his mediator. This was not exactly a conscious decision—since he was an infant I’ve had to translate, interpret, decode for him and for those around him; he wants a cookie and the music is too loud and Jack wave good-bye wave you can do it wave. As he got older it seemed like my need to interface became even greater. Because if I didn’t explain his need for zoomies and fear of fire drills at the school meetings, then who would? Someone needed to tell the cashier at Walgreens why Jack wanted to know how older her mother was and what kind of car she drove. Watching our psychologist model my invisible shield for Jack made me think. For the longest time I thought the ever-present umbilical cord that connected he and I was for him and his benefit, but really I wanted to filter the world for him through my mother-lens, to interpret it so it made sense to his unusual mind. And likewise, I wanted to be the translator through which the world saw him. I needed people to look beyond his odd behavior and unusual movements; I needed them to understand the boy inside. But slowly, surely, I am pulling back to reveal my son, to let those around us understand him as they will. And like a butterfly cocooned within autism, Jack is peeking out and testing the air with brightly colored wings. He is going to karate and meeting boys who make jokes. As we drove out of the parking lot, the image of his seldom smile and conversation with Miss Judy reminded me yet again of a butterfly; fleeting, fragile, beautiful. A magical creature who draws people in again and again to marvel at the wonder within, whether the wonder is zoomies or a fascination with license plates or the ability to remember dates. And like a butterfly in a stiff white uniform, Jack is tentatively flexing his vibrant new wings and telling the world Ki-YA. Bravo mama! Letting go is the most difficult thing but the benefit for the child is immense. You are both stronger for it. Fistpump to you! And for Jack! The world can always use more beautiful butterflies. I just want to thank you for given us an insight on Jack and your world! I am so proud of you and your family! Love you very much! Keep up the great work, I look forward to reading your blog every week! I so enjoy reading about Jack and his accomplishments. It is difficult for any mother to let their little one fly on their own, but once we step back and trust, only then do we see our butterfly take flight. God bless Jack and you too, mom! Rosanna told me to tell you that I am a friend of hers. I am also a retired teacher who had the pleasure and honor to have taught autistic children. Thank for reading, Paula, and for your kind words! Carrie, you and Joe are the wind beneath Jack’s beautiful wings! Keep up the great work, with Jack, and with your writing. I always look forward to your beautiful inspiring posts!